Collie Eye Anomaly (CEA) is a sometimes blinding congenital inherited eye disease. All dogs with CEA have bilateral choroidal hypoplasia (CH), also called chorioretinal dysplasia, a thinning of the vascular tissue in the back of the eye which does not significantly impair vision. Some dogs will also have optic nerve coloboma, in which the nerve tissue is not fully developed where the optic nerve enters the back of the eye. 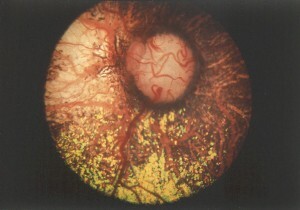 A few will have retinal detachment. Both of these more serious defects can be blinding. CEA is present at birth and does not progress, so there is no worry that an affected puppy will get worse as it gets older. It also does not cause the affected puppy any pain. CEA affected puppies generally appear normal because very few have defects that seriously impair vision. Those defects are within the eye and cannot be detected without special instruments so diagnosis can only be made by a veterinary ophthalmologist or with a DNA test. While coloboma and retinal detachment will be identified on exam, CH may not be apparent in puppies over 6-8 weeks of age because it is can be obscured as the pigment develops in the back of the eye, a condition called masked affected. CH is caused by a recessive gene mutation. Even though this gene does not by itself cause the more serious defects, dogs that do not have two copies of the CH mutation will not develop CEA defects. Other as yet unidentified genes, environmental effects, or regulatory DNA play a role in determining exactly what defects a dog will have. Carrier dogs, having only one copy of the mutation, are normal. There is no known relationship between CEA and coat or eye color. CEA has been identified in other dog breeds, including Collies, Shetland Sheepdogs and Border Collies. The CEA mutation is the same in all affected breeds. It is possible to misdiagnose CEA upon exam so if there is any question the DNA test can be used to confirm the diagnosis. If a dog is found to be CEA affected both sire and dam must carry the mutation. The parents, full siblings, and offspring of CEA affected dogs or identified carriers should be tested if they are to be used for breeding. Affected dogs should not be bred. Carriers should be bred only to clear-tested mates. CEA is a disease that is easily missed if breeders do not routinely do eye exams on young puppies. Statistically, only 25% of the puppies from the breeding of two carriers will be affected. If all puppies are not checked, including those going to non-breeding homes, the presence of CEA may escape notice. If puppies are not checked until after 7-8 weeks of age they may have become masked affected and the disease undetectable by eye exam.